It’s no secret that treating diabetes is complex. 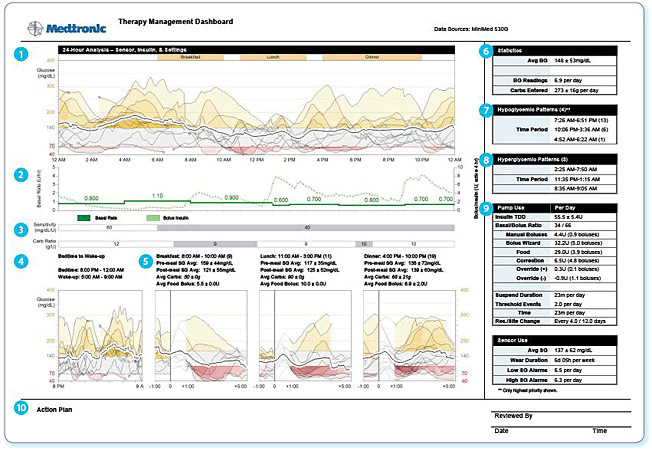 So we’ve developed software to give you access to the essential insights you need to make easier-than-ever treatment decisions. With CARELINK™ Pro Software you can spend less time interpreting data and more time working on solutions with your patients. A snapshot of the most important patient information in one place. Sensor glucose tracings assist in identifying incidents and/or patterns. 24-hour insulin delivery information. The solid green line represents the basal profile at the end of the reporting period. The dashed green line represents the average active daily Bolus™ insulin based on the active insulin time set in the patient's device. This shows sensitivity factors and carbohydrate ratios over 24 hours, based on the most recently programmed device settings. Realigns sensor tracings around meals (at the time carbohydrates are entered into the Bolus™ Wizard) to assess pre- and post-meal control. Shows the number of hypoglycaemic patterns, the time period in which the patterns occurred, and number of episodes that occurred during each time period. The top three patterns are listed based on the frequency of episodes. Shows the number of hyperglycaemic patterns identified and time period in which the patterns occurred. The top three patterns are listed based on the magnitude of AUC (Area under the Curve) above target. Key pump and sensor statistics. This table may also display the number of Threshold Suspend events and duration if the device supports the Threshold Suspend feature. A place to record notes for patient records, comments and recommendations for therapy, and/or documentation for health insurance providers. This helps uncover issues and offers therapy considerations. 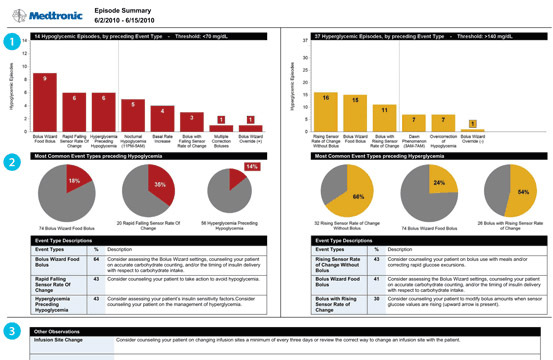 Reveals key events that happened prior to the patient's hypo and hyperglycaemic episodes. 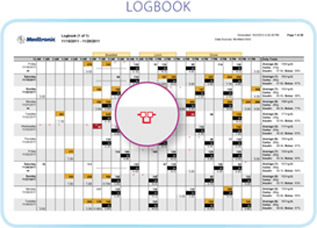 Provides you with quick insight into possible areas to prioritize and address. 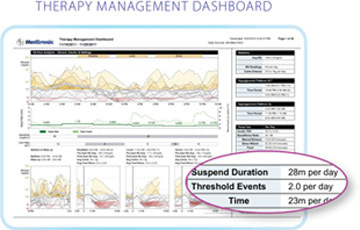 Guided therapy considerations based on the most common events and observations identified. Allows you to quickly assess these considerations for treatment planning. Allows you to record notes for patient records, patient instructions, or health insurance documentation. 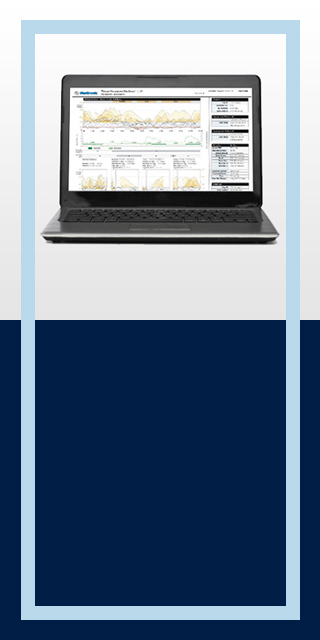 This symbol highlights ‘suspend before low’ and ‘suspend on low’ events on reports, so you can have more informed conversations with your patients. Based on the sensor glucose values, SmartGuard® can predict when your patient is approaching low glucose levels 30 minutes in advance and automatically stop insulin delivery29. 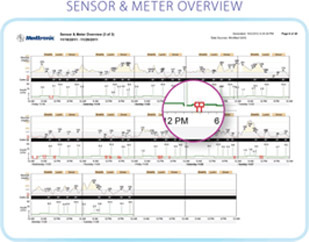 SmartGuard® displays on the following CARELINK™ Reports: Sensor & Meter Overview, Logbook, Therapy Management Dashboard, Device Settings Snapshot, Daily Detail and Adherence. 29. 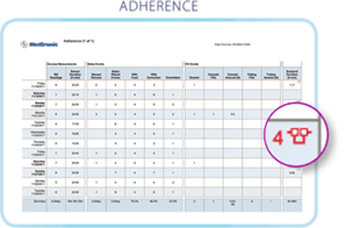 The dynamic suspend feature is based on certain criteria: sensor glucose must be within 3.9 mmol/L of the low limit and predicted to be 1.1 mmol/L above the low limit within 30 minutes AND the pump must not be in the refractory period.